Every once in awhile I come across a book about Mexico that is so inspiring I feel compelled to spread the word. One Hundred & One Beautiful Small Towns in Mexico (101 Beautiful Small Towns) by Guillermo Garcia Oropeza and Cristobal Garcia Sanchez is just such a work. Published in 2008 by Rizzoli International Publications, this generously illustrated coffee table book introduces readers to some of the most alluring places in Mexico. Spanish colonial towns, seaside villages, and even pre-Hispanic ruins are grouped by geographic regions, and almost every state in the country is represented. Lively text giving detailed historical background accompanies the eye-catching photos. Plus an appendix lists addresses of state and municipal tourism offices, hotels, and restaurants, making this a guide that should appeal to both armchair and active travelers who have a passion for Mexico. 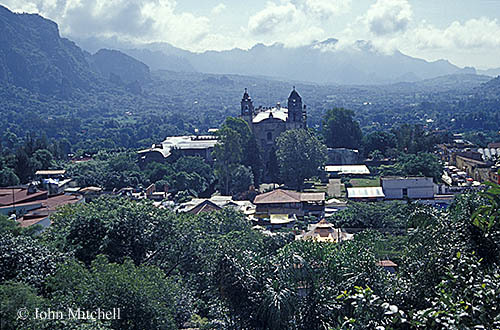 View of the Spanish colonial town of Tepoztlan, Morelos, Mexico. Please click on the image for more information. Click to see more images of small and not-so-small Mexican towns that I’ve visited. Thanks, Dave. I enjoyed your article. Tepoztlan is indeed a special (Dare I say “magical”?) place. Even Mr. Dole would probably like it.